Each tax season, millions of Americans line up hoping for a tax-refund from Uncle Sam (though they may not always get one). And as the U.S. population grows, taxes seem to become more intricate and harder to complete. As such, students enrolled in Wake Forest’s Master of Accountancy (MSA) program find themselves in a prime spot to be vital resources to American taxpayers and businesses. “As more individuals and corporations figure out ways to plan their tax liabilities throughout the year, tax regulations are becoming more complex in order to promote justice and fairness,” explains Don Kim, an MSA student in the WFU School of Business. Despite the increased volume of forms and supplements, Kim believes the complexity of filing tax returns is commensurate with the importance of taxes. “I believe that it’s necessary to have a complex tax structure in order to properly address the complicated financial structure of the United States,” he says. 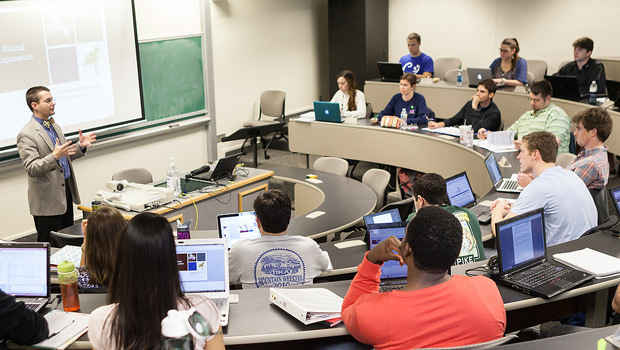 Annually, Wake Forest finds itself among the top business schools in the country. Wilkerson says the reason for those strong rankings are combinations of rigorous processes – from admissions to a demanding technical curriculum designed to challenge students and hold them accountable – for the continued success of the program. “I think it is a culture permeated by a restless pursuit of excellence – the faculty are never content with the status quo. In fact, I tease them about too much change. This culture is contagious, drawing students who have this same restlessness and/or cultivating this restlessness in them,” said Wilkerson. Wake Forest’s MSA program continues to boast a 100 percent job placement rate. Last year, Wake Forest students also scored the nation’s top pass rate on the CPA exam—a distinction they have earned a record 10 times.